I enjoyed A Mighty Love by VANESSA MILLER very much. When Malcolm turns up at a Bible study, it really shocks Shay. Shay, a Christian long before Malcolm, finds Malcolm reading a Bible hard to believe and accept. All of a sudden she begins to distrust him. She's on a familiar trail. Shay mistrusts all men thinking guys only want a woman's body. I don't think Shay had ever thought about men as true Christians putting the Love of God first in their lives. Really, the novel becomes a battle between Shay and her inner demons. Finally, her friend Darla reminds her to trust God. He is indeed able to take care of every situation she will face on the job and in her love life. Darla believes that God is in control. She believes we can faithfully trust Him not to allow others to hurt us beyond His plan for us or our ability to handle the pain. At 16th Street Baptist Church in Birmingham, Alabama in Sept. 1963 a terrible and planned catastrophe took place inside the church. Men with great hatred in their heart for people who were not of their race decided to bomb the church during Youth Day. This was a special day for young black people and their parents, relatives, siblings, friends and neighbors. The girls were dressed in white. The boys in dark pants and white shirts with ties. Sadly, that Sunday was interrupted by a bomb thrown by men in the community. 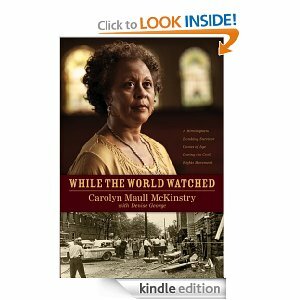 One little girl, Carolyn, lived not far from one of the men who would be charged with the crime. The only warning given, and it wasn't really a warning was a phone call received by Carolyn because she worked or helped out in the church office. She picked up the phone that Sunday morning and heard two words "three minutes. "She had no idea what these words were pertaining to or who had made the telephone call.